Is it just me, or is there some major hypocrisy here? We see men who would stay up all night (really had been for days), planning how they could by subtilty and deceit catch and harm an innocent man. The night before they had gone with Gentile guards and soldiers into the garden to illegally arrest and “try” Jesus. 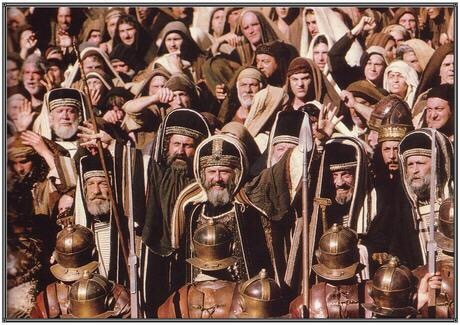 And yet, they refused to go into the judgment hall because they didn’t want to be “defiled.” And worse, I wonder what Pilate thought when they stood without and made him come out to them once Jesus had been sent in With the soldiers. Then further, they couldn’t even answer what it was they accused Him of. Oh my. What a double standard. What a bad testimony from people who were supposed to have the oracles and testimony of God committed to them. I’m reminded in reading this record, of the importance of keeping a soft heart, and keeping hypocrisy out of my life. We see in Scripture that when we allow these to creep in, it’s a downhill road from there. Not only are we blind to the wrong in our own lives, but we strain at a gnat in others’, and can become a bad testimony to the world. Might we examine our hearts and lives, that we might see clearly, judge righteously, and practice grave and truth as our Lord did and does. ← Not be offended (stumble).